John Layman is a comics writer who’s created fun titles like Bay City Jive and Puffed. He’s also worked on other licensed properties like Left Behind, Army of Darkness, Thundercats and Xena the Warrior Princess. Aside from all that, he’s also known for creating a little something called Chew. 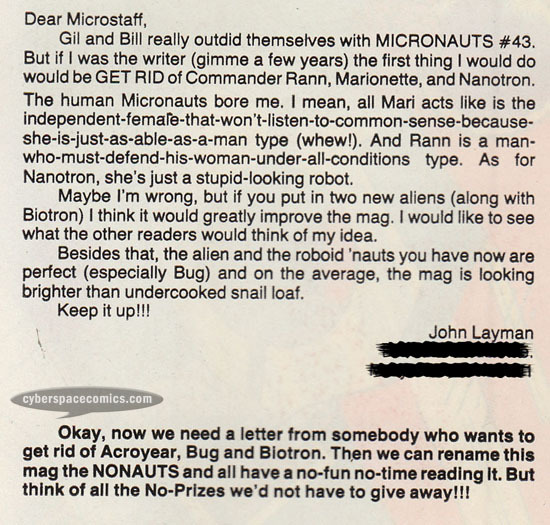 He got a letter printed in the Micronauts #48 (cover date – December 1982), recommending that the creative team get rid of some characters that he finds uninteresting.